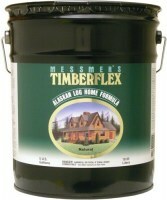 Messmer's Timberflex is the #1 choice for customers seeking a beautiful natural wood finish for vertical surfaces. Suitable for log home siding, wood timber frame, cedar wood siding, etc., this 3 application system beautifies and protects exterior wood. With the highest quality pigments and UV absorbers, high solids content, and state of the art mildewcides, Messmer's Timberflex products are a great alternative to more expensive competitors. 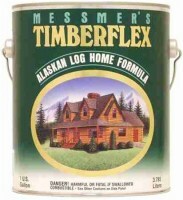 Messmer's Timberflex is a multiple coat system which gives a beautiful, varnished appearance to exterior log and wood frame homes. Two color coats, one clear top coat. Timberflex color coat, one gallon covers 75-150 square feet of wood surface with the recommended two coats. Optional: Use three color coats to yield a gloss finish and deeper colors than two color coats.